One of the most common causes of chronic disease and premature suffering and death in pets is the development of cancer. While cancer may occur in any aged animal, the incidence is most common in middle aged and older animals. Cancer may affect multiple organ systems, including the lymph nodes, digestive tract, liver, spleen, kidneys, heart and even the brain. Symptoms of cancer will vary depending upon which organ system is involved. Many times the initial symptoms are nonspecific, and may include lethargy, loss of appetite and weight loss. Changes in thirst and/or urination also may be seen. With lymphoma, the most common type of cancer seen in pets, animal guardians may feel enlarged lumps under the neck or near the shoulders. 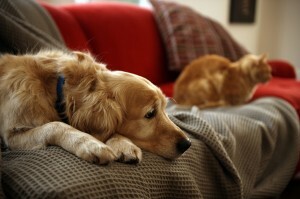 Some pets may develop vomiting, diarrhea, coughing and/or difficulty breathing. With advanced cancer, pale gums may be noted, and even weakness and collapse, which may occur suddenly. As a more holistic oriented veterinarian, I do recommend at least once to twice yearly veterinary evaluations and exams, with periodic blood work, stool checks and urine analyses done, especially as pets get older, in order to pick up cancer as early as possible. I do recommend a more holistic life style for cancer prevention, including minimizing unnecessary vaccinations, especially as pets get older, as well as feeding species appropriate preferably low-carbohydrate, low-grain diets. In middle aged and older pets I will often recommend antioxidant vitamins and supplements such as Proanthozone, as well as Cell Advance. I also love the preventative cancer supplement known as Transfer Factor, which I have sold for many years in my veterinary practice.